Last Saturday, October 4, as you probably already know, was WORLD CARDMAKING DAY!. Yes, I am a bit behind. But, you see, I had to work last Saturday. Tired as I was when I got home, I was determined to NOT let this special day slip by without me doing SOMEthing to commemorate it SOMEhow. A brief story first. When I first saw the stamp set White Christmas on page 31 in the Stampin' Up! Holiday Catalog, it did not trip my trigger, float my boat, do anything for me. However you say that it just did not appeal to me. So I bypassed it. A friend of mine wanted me to order the White Christmas set for her. Long story short, I messed up on the order (first time I'd ever done that in nine years! What was I thinking -- or NOT thinking?) and I ended up ordering two of these sets. Instead of sending one back, once I saw it in my hands, I saw that it wasn't so bad, so I decided to keep it. Still not quite sure of it though. When I got home from work on World Cardmaking Day, that was the set I turned to. I'm so glad I decided to keep it! Now I want to keep creating with it. Especially when I am seeing such DARLING cards being made with the set on Pinterest! Speaking of Pinterest, I have found that little corner of social media to be probably the best creative inspiration E.V.E.R.! Don't you agree? It was a blast to make from start to finish. It just came together so wonderfully. The first thing I did was to emboss the trees and snow in black. I then used the embossing as a resist to add my Marina Mist sponging. 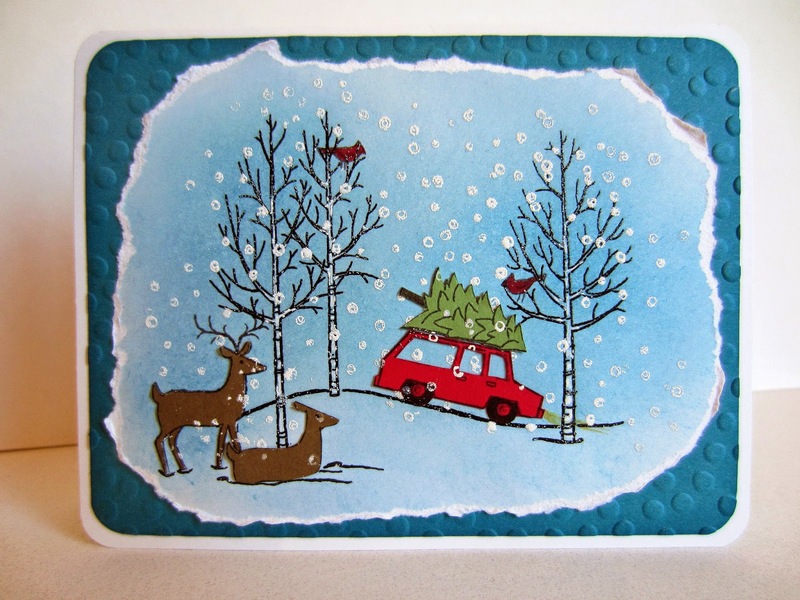 Then I stamped the buck, the Christmas tree and the SUV in black on colored cardstock, then fussy cut each of the pieces. Of course, I wanted my buck to STAY a buck, and I did not want to attempt to cut out his antlers, so I stamped him into the scene first, then overlaid the stamped antlers with my cut-out deer. He looked sooooo lonely, standing there all alone in the woods late at night. He needed a mate. Right? But I only had this buck stamp. Hmmm. Conjuring Paper Seedlings . . . Aha! I eliminated the antlers, one ear and the legs to create a doe lying in the snow. Brilliant, if I do say so myself. So Bambi's mama joined the snowy scene. I added some white embossed snowflakes using the stamp that came with the set. There! Nice scene. Now what? I dragged out all my Framelits. And tried the biggest ones. None of them were quite right for it. Since I hadn't done tearing in awhile, I thought that might be just the perfect look for a snowy night scene. Originally, I had planned to sponge the torn edges with the Marina Mist to blend it all together. Once I had torn the edges, however, I felt the brilliant white edges made it look even snowier and more natural. Mounted on top of a piece of Island Indigo cardstock that had been embossed with the Decorative Dots Embossing Folder to echo the snowflakes in the stamped image, then on top of a white card base, it looked just right. I love how this card turned out and keep it standing on my counter in the kitchen. It makes me smile every time I look at it. I hope you all like it too! OK. I admit that I ended up making it into WORLD CARDMAKING WEEKEND. On Sunday, the set drew me once again. A friend had given me some really cool blue tissue paper, so I thought it would make a perfect background for this snow scene. So, I proceeded to use the faux silk technique to apply it to cardstock. Well, it looked sort of cool. But the more I added to it, the more amateurish it looked. When I look at this finished card, all I can think is: B.L.U.E.! It should probably be garbaged . . . But, I do like ONE thing I did with this card. Once again, I fussy cut the various elements, but this time with Designer Series Paper! 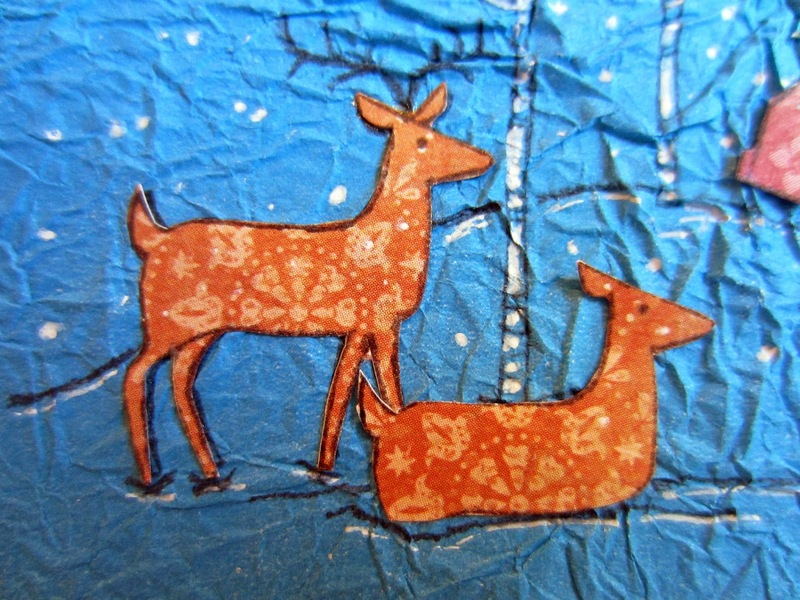 Do you like my printed deer couple? 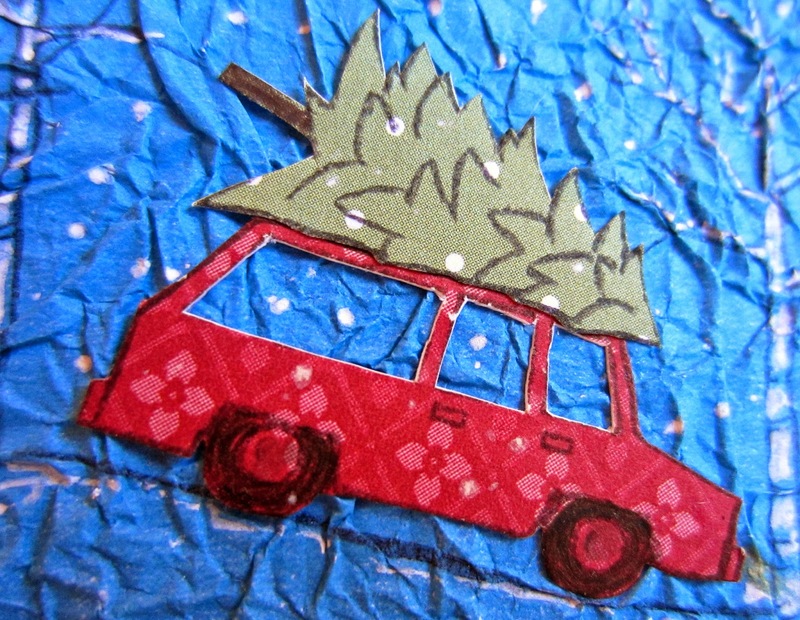 And, how about my patterned Christmas tree and the SUV on which it rides? Cute, huh? Yup. But, I refuse to show you the entire card. Suffice it to say it was definitely a fail. So, share with us: Have you ever looked at a stamp set a few times only to feel it did absolutely nothing for you? Then, for some reason, you have that very same set in your possession. And you turn out loving it? This was another incident of messing up turning into a happy accident. I will use this set a lot more, I promise! This is soooo cute! I love it! I will be sharing with my sister who is the card maker of the family! Thanks for sharing! OHH, Linda! I bow before you, O Brilliant One!! Your creative creation of the doe blows my mind! I hope you don't mind me using that idea at some point, giving you credit for it. I'm not usually a big fan of the torn look, especially for a full panel, but in this card it is perfect -- really makes the snow pop! I love all the details on this card, including the cardinals! Really good work! Now I'd love to see you do something with the second set of deer and the car/tree if they can be salvaged. P.S. A belated Happy World Card Making Day to you! I worked on my last ATCs _R_Us swap (the Cat Book) in lieu of making cards, but I guess ATCs are a kind of card, right? I love the techniques you used on this card! The torn edges and the falling snow are beautiful. So glad you joined us at the Make it Monday Party! See you again next week. That is a cute card. I hope to use that set to make my cards with this year. Love that card! It's so pretty. Oh goodness! This is super cute! So so adorable! I love paper crafting! Coming to you from the Sits community Link-up. Sharing this on my social media! It's very pretty and it makes me exited for Christmas. Come again to link up on Monday. I've never heard of cardmaking day. Love your Christmas card ideas. Thanks for linking up to Show Me Saturday. Hope to see you there again this week! Such a cute card! Love it! Thank you for sharing with the Handmade Café!